Many areas of the province saw rain over the weekend putting a stop to field activities for a day or two. Corn planting is wrapping up and progressing well with corn emerging as quickly as four days after planting. The earlier planted corn is at the V3-V6 stage and the corn planted later on the heavier ground is from planted to the V2 stage. There have been some corn replants primarily due to excessive rainfall; however, the number of replants is below average. Side-dressing is underway in some areas and will likely be in full swing next week. OMAFRA Field Crop staff have begun soil nitrate survey sampling to gauge levels at various sites across the province. Results will be posted to FieldCropNews.com as they are made available. Since these PSNT values are collected from specific fields, it is important to realize they are intended to give an idea of what is happening with soil N across the province. Since soil N levels vary greatly because of soil type, crop history, fertility, addition of manures, etc., growers are reminded that proper recommendations for specific fields can only be made based on quality samples taken directly from those fields. Many areas are completely finished with soybean planting with the exception of heavier soils in Essex, Chatham-Kent, Lambton and Niagara. The crop ranges from the cotyledon to second trifoliate growth stage. Due to the quick emerging crop, not all intended burndowns or pre-emergence herbicides were applied. As a result, a number of fields are dealing with heavy weed pressure. Weeds grew relatively quickly last week but with the recent cool weather growth have slowed down. Weed control during the early stages of soybean growth are critical. When timing post-emergence herbicide applications the growth stage of target weeds is generally more important than the growth stage of the soybeans. Bean leaf beetle feeding has been observed in Essex County; however, thresholds have not been reached. Some re-planting has occurred in areas that received excessive moisture. Conversely, there have been reports of poor stands where seed wasn’t planted into moisture, particularly in Huron and Bruce Counties. The number of plant stand issues so far has been low compared to most years. First-cut alfalfa is in full swing, with most dairy hay finished. Yields and quality have been good to date. Alfalfa weevil has been found in many areas. Scouting for feeding on regrowth after first-cut is important as weevils are entering the most damaging stages of third and fourth instars during the early stages of crop regrowth. Control is warranted if there are two or more active larvae per crown, or 4 to 8 larvae per 30cm by 30cm (1ft2). The winter wheat crop is progressing well. Fusarium Head Blight fungicides have started to go on in the southwest portion of the province. However, due to the crop progressing quickly and the ideal window for a T3 fungicide passing, a number of acres in the southwest did not receive a T3 fungicide. As the crop progresses eastward growers are reminded to scout their fields for proper fungicide timing. 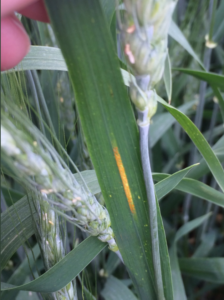 Stripe rust has been reported in Ontario on June 5th in the St. Mary’s area (Figure 1 – Photo credit: Nicole Bloetjes) on a susceptible variety. Specific variety ratings for stripe rust can be found in the Ontario Cereals Crops Committee Performance trial data at www.gocereals.ca. Growers who have not yet applied their T3 fungicide and have a susceptible variety should continue to scout their fields and wait for the proper T3 fungicide timing if possible. Early spring cereal fields are at first to second node. Cereal leaf beetle (CLB) continues to be found in a number of non-traditional areas including Essex and Niagara Counties. Continue to scout for CLB in winter wheat if crop is approaching heading. One CLB adult or larvae per stem warrants control after boot but prior to heading. It is also important to scout for CLB in spring cereals as the crops progress. Canola is progressing well with most of the crop between the three and at the five leaf stage. Flea beetle is being reported in canola; however, flea beetles are less active in the cool weather. Remember that flea beetle must feed on the seedlings to be exposed to seed treatment insecticides. Foliar insecticide application is not warranted until at least 25 per cent foliar feeding is observed, and once the crop is at the four leaf stage it can likely outgrow the feeding damage. Swede midge emergence was reported last week in the areas of Shelburne and Elora, and emergence is likely occurring now in all canola growing regions. Swede midge pheromone traps should be in place now and checked every few days through to bolting. Information on swede midge can be found on FieldCropNews.com. Planting is about 30 per cent complete with the remaining acres expected to be planted later this week and into next week.